Amdo Craft is a small company in the Qinghai province of China. The company exists to train Tibetan nomads and farmers, both women and men, in producing marketable handmade items and then helps them sell those items, locally and internationally. The profit of the sales of the handicrafts goes back to Tibetan communities. These Tibetans live at high altitudes in remote locations which present many challenges, such as extreme cold and harsh conditions. They rely almost entirely on their animals for their livelihood. Their only resource comes from yak and sheep wool as well as yak milk and tallow. Some families pick caterpillar fungus, a popular item in Asia, to supplement income. 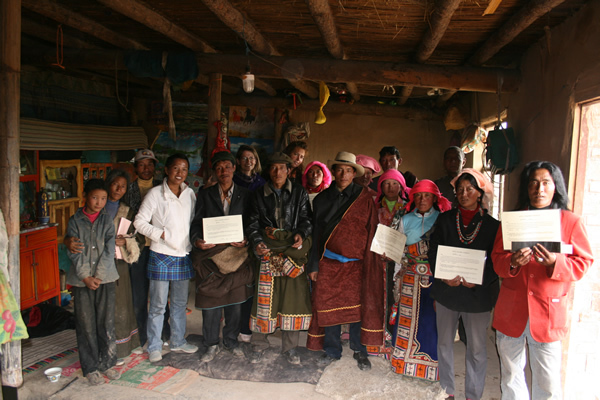 Amdo Craft trains these Tibetans to card, spin, weave, felt, and knit their wool into beautifully homemade handicrafts. In 2011 the nomads were trained in how to make yak milk soap. High quality is ensured by intense training and constant quality control. A wide range of products are being sold worldwide through the internet, shops, café’s, and art galleries. Feel free to browse our website and check out our bags, soap, and many other products in an effort to “Help Us Help The Nomads”. Thirty-four year old Drolmo attracts one’s attention with her bright eyes, which takes everything in, her shy smile, and her eagerness to please. She does not speak freely of her own shame of being divorced from an alcoholic husband, leaving her as a single parent of a three year old. Her community has labeled her a “patient” due to a abdominal surgery several years ago. This stigmatism does not offer encouragement or support from others that she can indeed be useful to her family and community. Since participating in the handicraft training program, idle days have been replaced with eager hands and renewed hope as she produces many beautifully woven handbags. Drolmo is a “natural” in terms of skill, initiative, and creativity. When paid for the first time for her outstanding, colorful products, she quietly smiled for she would finally be able to buy enough flour to last through the winter. Through Amdo Craft, Drolmo, her aged mother, and her young daughter now have a source of hope. Drolmo is one of sixty Amdo Tibetans in Qinghai and Gansu province who produce these handicrafts.